On Tuesday morning I drove to Johnson City, New York, to help judge a bra contest. It was conceived by Louise Tiemann, who did an absolutely fabulous job of making everything work. Over 80 entries were submitted--and what a stunning array they made. For more information and to see where the bras will be exhibited before the November auction, please visit www.brazieres4acure.blogspot.com. We are unable to tell who won--it's a surprise until the September 4 official start of the tour. Let me just say how moving it was to see how much time, effort, and money had been expended to support the Cure. 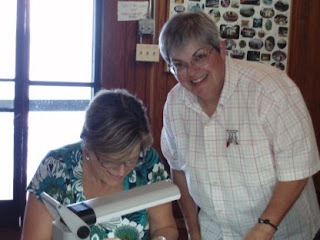 Lorry Chwasik also judged and she posted pics on her website at http://quiltsbylorry.shutterfly.com. The other judge was Gina Chapman from the American Cancer Society. Lorry and Gina: It was a pleasure working with you both! Louise made the ribbons and put untold miles on her car to distribute bras donated by Maidenform and to collect the finished entries. Kudos, Louise, on a job well done! Let's hope a cure is found soon--breast cancer touches so many lives--if not us personally, someone we love. Remember to have yearly mammograms, and urge your family and friends to do the same. Next post will be back to the Retreat! More finished tops to enjoy! 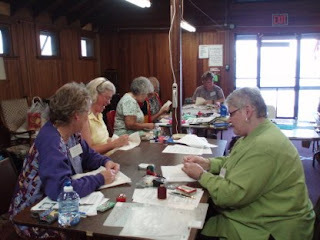 Our last full day of classes was filled with laughter and lots of stitching. 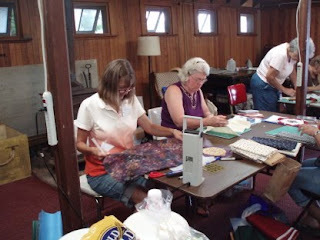 Kathy, the Wiawaka housekeeper, joined us for the hand quilting portion. 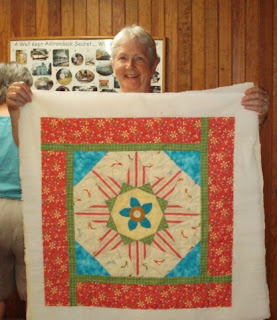 She had never quilted before and was pleased with her results! 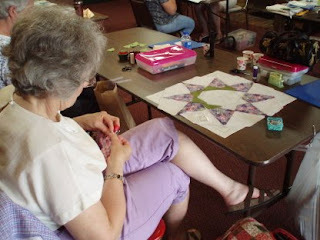 She actually finished the hand quilting on the small wholecloth piece before the end of the day! Way to go, Kathy! Lucille and Kathleen joined us for the last day. Both are lots of fun and just great to be around. In this photo and the next one you can see such a flurry of activity! The hustle and bustle to get as much finished as possible. Liz's diligence paid off--here she is with her finished top. She actually got it basted before the end of the day! 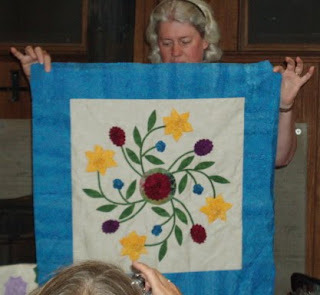 The center is from a huge floral that Liz fussy cut. And the large star points are from an Art-Deco type fabric that were also fussy cut. Liz ended up using that fabric a bit differently than she anticipated, but it is stunning! It always cracks me up to see a photo of someone else taking a photo! I couldn't resist including it! Mary Ellen's finished top! She worked very hard on it and did a fabulous job! Her points are sharp and she used colors she wasn't sure would work--but they did! Paula was determined to get as much done as possible before leaving--so she kept her head down and sewed! 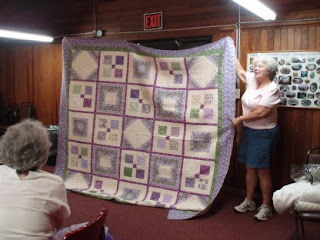 She had the top done and basted by the end of the second day and then had over half hand quilted on the third day! It is bright and colorful and too cool for words! Sharon G. was also determined to get her top done and basted. 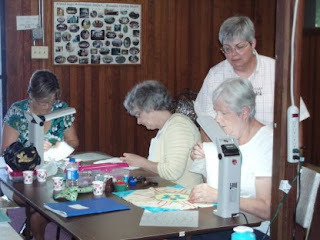 She finished the basting by the end of the third day and also fit in the hand quilting portion of the class. So she is ready to quilt up a storm. She even went home and basted her hexagon quilt from a prior post! This from the lady who professes to hate basting! Enough for tonight. I am off tomorrow to judge Bras for the Cure in the Southern Tier. It should be lots of fun. I think the next post will finish the retreat pictures--I can hear the sigh of relief from some of you and the groans from others who wish to live vicariously. More great show and tell! Some had more than one thing to show; I selected what I thought was the best of the best for tonight. Please realize that the weird angles and odd expressions are simply the camera operator (that would be me). Need I say more? Sharon G. had the top she had just finished in an almost year-long class with me. 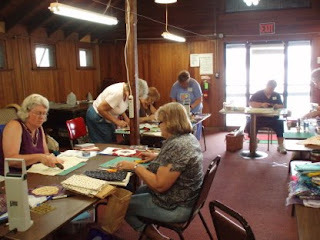 The blocks are hand pieced and then the top was set by machine. 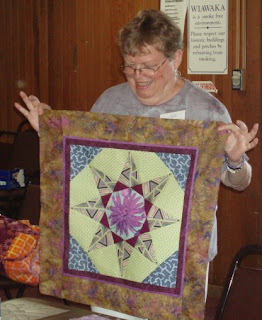 Paula completed the Hexagon Bliss class earlier this spring and she had it hand quilted and bound! The top is completely hand pieced. Sandy was especially proud to have finished our year one project. She hand quilted the entire quilt and it is bed-sized. 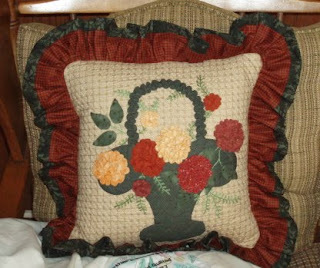 Lucille brought the pillow she made from Anita's French Basket block. Love the double ruffle! Liz had lots of show and tell and it was hard to choose just one thing. But her hand dyed fabrics were so scrumptious I had to choose that. Let it be noted that Liz did NOT pass the fabrics for us to fondle. She kept close watch on all of them and they were always near her hands. Notice that there is also a pile of grays on the table. Martha brought the project from year three--Mariner's Compass--completely finished! Ladies, congratulations to you all on a job well-done. 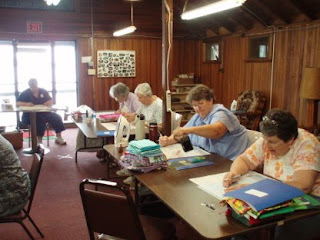 It is so exciting to see finished projects--and finished is defined as top or completely quilted and bound. It's wonderful to be so expansive on definitions. Next up: Pics of finished Stars of Hope. You will be amazed at the creativity! Show and tell is always one of my favorite events! And these quilted items are wonderful. First up is Mary Ellen--unfortunately, I did not get her face in the photo (just her eyes!). I didn't crop the picture so that you can see the lake outside the door--how's that for a lake-front classroom! 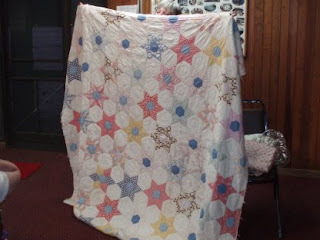 I digress--Mary Ellen's quilt is one she believes her grandfather made and it is one of her prized possessions. 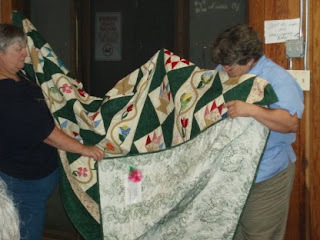 She is now collecting fabrics to recreate the quilt herself. 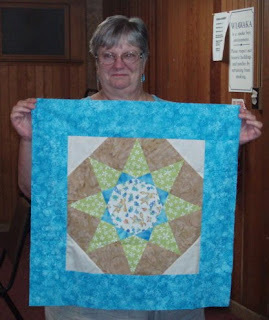 Next is Gale, who only started quilting about a year ago. 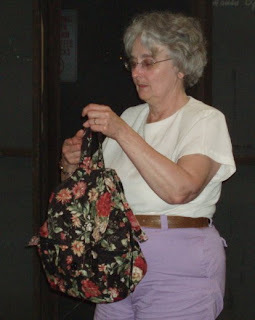 She recently took a quilted backpack class and here is a photo of what she made. It is so beautiful! 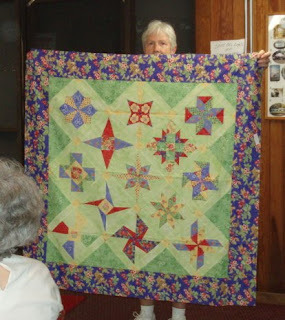 Gale also took a beginning quiltmaking class at Patchwork Plus in Marcellus and made this four block wallhanging from start to finish, including the quilting! Great job! One of the best surprises of all is when students bring in work from prior retreats. Cindy had two tops done. First is the project from year five--Dancing Flowers. 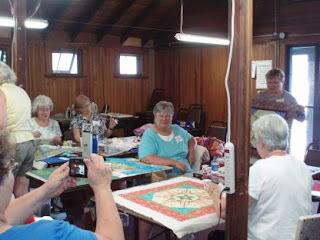 Anita Shackelford taught the dimensional work and I did the flatter applique portion of the retreat. I love Cindy's color and fabric selections. 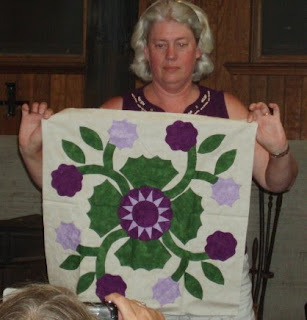 Cindy also finished the top from year four--the Whig Rose. Anita did the applique portion and I taught the hand piecing technique used on the center. It was great fun and the results are spectacular. As someone asked in the comments, yes, there was time for porching and relaxing. Since everyone is an adult, students came and went as they desired. Some went shop hopping one afternoon, one went on a boat tour of the lake, some napped after lunch--and worked when they wanted to. Some waded to cool off between lessons, some kept their noses firmly to the grindstone. 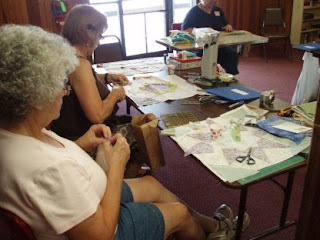 We took time each day to play a session of Quilt-O for fabulous prizes and that seemed to be popular. Tomorrow I'll post more show and tell pics and then we will be on to day two of retreat! 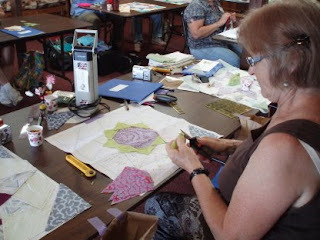 After cutting out the pieces and marking them for hand piecing, the fun began. 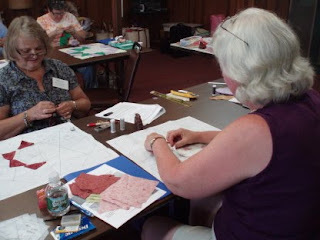 It is so easy to achieve sharp points and set-ins with hand piecing. My preference is not to hand piece any block that can more easily be done by machine--four and nine patches, most blocks without set ins. After explaining the finer points of pinning (you can see how seriously I take this responsibility), students were off and running. Sandy had an ocean/palm trees scene in the center octagon. 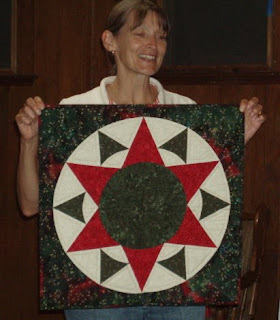 Gale had a bold red/purple check fabric for her center, surrounded by green small star points. 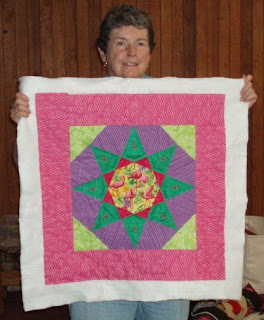 Myra (shown below) and Liz (not shown here) both used Kaffe Fassett fabrics. 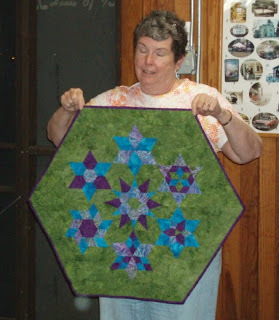 Myra fussy cut a large purple cabbage as her center and then pieced lime green star points around it. 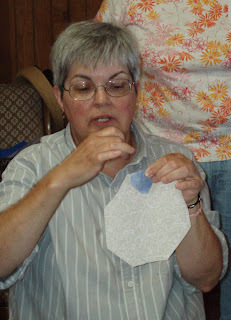 Nancy had an ivory tone-on-tone center ready for applique. 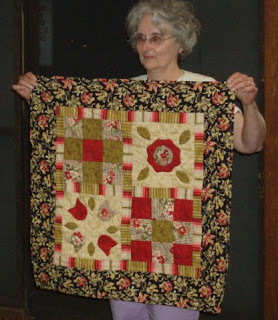 Cindy's mom helped her choose fabrics, so she had a rose print floral as a center, yellow small star points and then a dark rose tone-on-tone for the large star points. 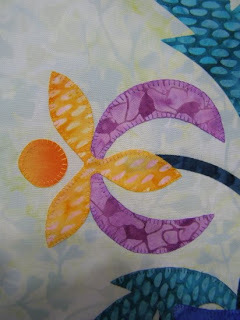 Wait til you see this done--we customized a border to really complement the center. Sheila had a patriotic theme going, with a fussy cut center. Tomorrow I will post pictures from the show and tell session. Fabulous stuff--even some finished projects from prior retreats. Stay tuned! P.S. For those of you who know I usually wear a jumper and blouse to teach in, you will be shocked--shocked, I say--to discover that I actually wore SHORTS on two days and SKIRTS on two days. I know, I know--the world feels a little different now--and I actually taught a class locally this week in a skirt and blouse! Surprise! I have legs! 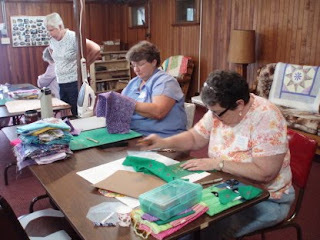 Three days of hand sewing, good food, great fun and the fellowship of like-minded women--who could ask for anything more! We arrived on Wednesday afternoon and unloaded our stuff--why is it that quilters can never travel light? We had a fabulous dinner and then went to the House of Trix for our evening program. 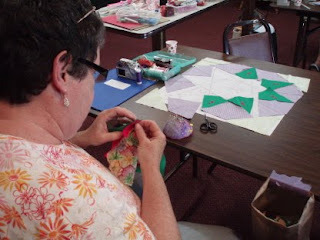 Each quilter told a bit about herself. Some were returnees from prior retreats and some were new--some so new that this was their first retreat ever! I came up with a new game to play--Quilt-o! It's tons of fun and is played similar to Bingo but with quilting terms. It even works for non-quilters because you don't have to define the terms--just find them. The first full day found us back in Trix. It's a huge room over a small indent in the lake. The water actually runs from behind the building, under the building and then joins the lake. In the first picture you can see my view from the rear of the room looking toward the lake. There is a wonderful porch and you can wade directly off the porch! 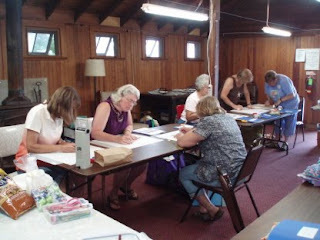 Martha, Cindy, Sheila, Nancy, Myra and Liz are making their templates. On the other side of the room we have Mary Ellen, Gale, Sharon G., Sandy and Paula. After making the templates, fabrics were spread everywhere and carefully considered. 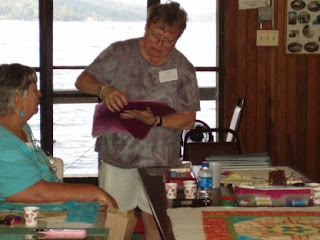 In the true spirit of quilting, fabrics were shared and opinions freely given. You can see how intent everyone is on making the right choices! Some were able to choose fabrics for all parts of the design right away and others chose one fabric at a time and cut those pieces and auditioned for the next set. It was fun to see the choices! Next post will include even more photos. Be prepared to live vicariously through the blog as we explore Retreat 2009. Did you all remember how special you are? I almost fell off my chair reading the comments on the last post! Sheila, LOVE the microbrewery idea! And the slogan! The hops vine is non-invasive, unlike my silver lace, which grows under the siding and is coming out around my second story windows. It's just a nice vine--nothing more to the story than that, unless I really do start the brewery. I wonder how many hops I would need--probably more than I have at the moment! Stay tuned for retreat pictures. Until then, stay safe, keep quilting, and remember how special and unique you are. Greetings! 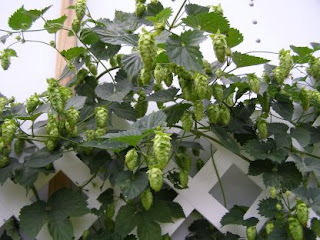 In one of the July posts I showed a picture of my shed covered on one side with hops vines. I thought it would be a good idea to give you an update! Here is the darker green hops vine today. It is loaded with hops and they sort of look like mini pinecones. 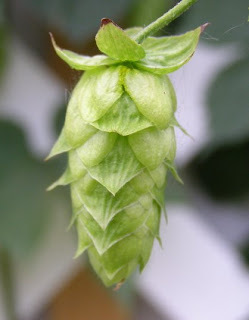 Here's a close-up of a hop--or is it still hops? I'm not sure! The bottom has what looks like corn silk! Really cool looking. 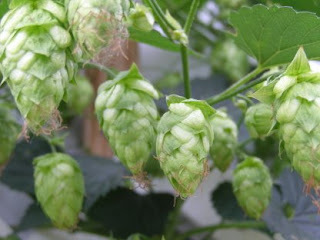 I know you are all waiting with held breath for the next hops installment--stay tuned! I finally finished mowing the lawn today! Had to do a bit more raking, but not as bad as the lower section. Now it will just have to quit growing until I return from retreat! I have so decreed it! (For those of you who think I must mow at the speed of a snail, please remember that I have a two acre lawn with lots of trees and trimming!) The butterfly bushes are outdoing themselves this year--the air is redolent with an almost blackberry-ish scent. Okay, back to retreat prep. It's time to do the handouts with digital pics--lots of work but I love the finished product. I'm afraid tonight's post will not be very interesting. Most of my time has been spent basting quilt sandwiches for next week's retreat. Then I mowed (and raked) most of the lawn. The biggest part. There were times when I thought my mower might throw in the blades and cry "enough" to so much grass. But my trusted Millenium model Yardman came through with flying colors. Tomorrow it will be the east side of the lawn and then I am done for this time. Even the part I raked and mowed several times a few days ago needed to be done again! Three full days of classes always sounds like a lot of time. Then we get there and the time is over before we know it. Okay, you have either been stimulated by this splendiferous post or you have hit your head several times on the keyboard as you fell asleep while reading it. Either way, it is over. You might, however, want to bookmark it as a sleep aid for those nights you just can't drift off. In one of the previous posts, you saw pictures of Callie "helping" with a top in progress. I thought I would share more of that with you. 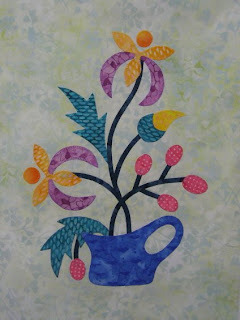 This pattern is from Quiltmaker (July/August '09 issue) and was designed by Edyta Sitar. If you take a look at her sample, you will see it is done in much darker colors with a more patterned background. I chose to use all batiks in mine, including the background. Here is a close-up of the stitching. The leaf at the upper right of the picture has not yet been stitched. I used 60 wt. Mettler cotton thread to do the applique with a tiny hand blanket stitch. The dark green stems were made with the Clover 1/4 inch bias tape maker and were hand appliqued. It's a lovely design and will eventually have a series of borders surrounding the center. That's about it for tonight. See you Wednesday or Thursday--only time will tell which one it will be! When I got home last night after the last spate of events of Saturday, August 1, it was 11:40 p.m. and I looked at the computer, which was off, and debated about posting. Then a wave of reality set in and I went to bed! Sorry, I just couldn't do it. The mind was willing, but the body just said enough. It was a fabulous day, when all was said and done. I went to a bridal shower in the afternoon--my bestest friend Cindy's oldest son is getting married in September. I have a picture of him sitting in my lap sewing a small quilt for his Care Bear--he was young enough not to be able to reach the foot pedal and still sew! Someday I will pull it out (read: find it!) and share it with you all. Ronnie's a good sport and he won't care (and if he does, well, what can he do about it?). Hard to believe he's all grown up, has been in two tv series and is a respected and much loved radio personality in Syracuse. What a guy! When I got home from that, I started prepping for the upcoming retreat. (Nine days and counting!) I was doing pretty good when I got a call from a friend who needed some company and good cheer. It was that foray that got me home so late! So as I was debating "Blog" or "Bed", bed won. It was close! I had hoped to bale my lawn today but no such luck--it poured most of the day. I did find one short stretch of time when I used the hand mower on the east and south sides of the house--it was damp but I needed to get it cut if I could. So I mowed, raked and mowed again--all in the same spot. Yes, it has been a while since I mowed last--but I've been busy and then when I've had time it has rained! Hopefully tomorrow will be sunny and I can get out the big mower and "Git 'er done"! Sorry for no pics tonight. I will try to do better tomorrow. Many thanks to all of you who left comments on the last post. It made me feel really good.